TOTO is the world’s largest plumbing products manufacturer. 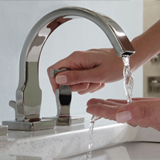 We offer a complete line of commercial and decorative plumbing fixtures and fittings, faucets, accessories, shower and flush valves, as well as lavatories, toilets, Air Baths and urinals. More than 1,500 TOTO engineers and their colleagues are committed to achieving the seamless integration of performance, conservation, technology, and innovation. We concentrate on creating a more enjoyable bathroom experience through products that infuse sophisticated style with substance, optimize water conservation and provide consistent, exceptional performance. In this course, the design professional will gain insight into water efficiency and the role of sustainable plumbing. We will discuss testing and standards, as well as emerging environmental technologies. The increasing importance of product transparency will be addressed, especially regarding contributions to LEED certification.